McCartney's Abbotswood 'Indie' is an amazing stallion with dreaming pedigree. He is 10 years old stallion with the sweates head you could dream of with small ears, a strong neck, short back with a long strong sloping shoulder, flat bones to die for, wide chest and rounded croup with a well settled tail. 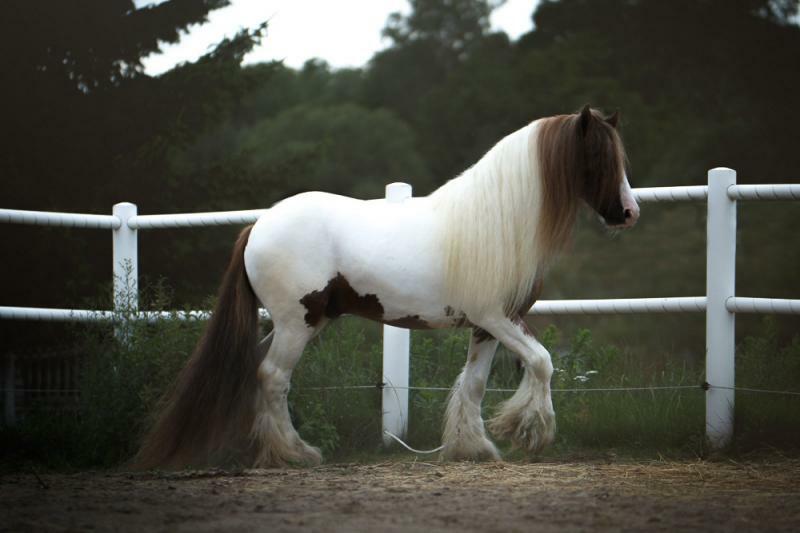 He has a magnificent feathering and classic Gypsy Cob conformation. Pedigree: He is coming from one of the most esteemed lines of Traditional Gypsy Cobs - carrying the blood of legendary horses such as: Tir Na nOg (aka Bartley) - DNA verified son of Rufus (aka Parno Paub), Gov'nor, J.R, The Lion King, Eddie Allock Black Horse, Old Henrys Horse, Old Coal Horse or The Lob Eared Horse. His grand sire - McCartney's Highland Prince - Cookie is a well-known stallion around the world. Cookie is an outstanding producer of quality, titled and premium foals. He is the sire of one of the most prolific ever winning cobs in the show ring - Abbotswood Gorgie Boy - 5 out of 5 wins at the Championships, CHAMPION at The Royal Windsor Horse Show 2010. ​Abbotswood 'Indie' daughter - McCartney's Daisy May starts her career in 2017 with already winning results, Daisy May won the large Nct class and went to be overall Coloured Champion, next show she became Reserve Champion at Pembrokeshire County Show. He is registered in CHAPS.